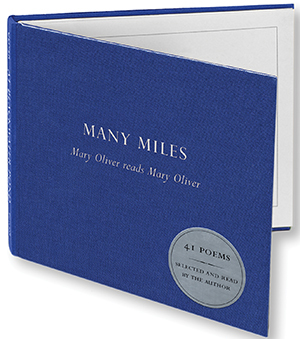 Following the success of At Blackwater Pond (Beacon / 0700-6 / $19.95), this second CD from best-selling poet Mary Oliver contains a selection of forty-one poems, read by the poet in her steady, magnetic voice. Oliver recites from the full range of her poetry-from her classic nature writing, to her verses for her mischievous bichon Percy, to her ever-deepening spiritual poems. The CD comes in a handsome full-cloth package that includes a booklet with an introductory essay by the poet on the magical dynamic between speaker and listener, a table of contents, text of the title poem, and a photo of the poet. Many Miles will be a most welcome addition to the collections of her readers.